1. Card-type full-function remote control. 2. bluetooth phone support bluetooth music player. 3. Support reverse video input, reversing the priority. 4. Support shuffle, repeat all, repeat single, repeat directory. 5. 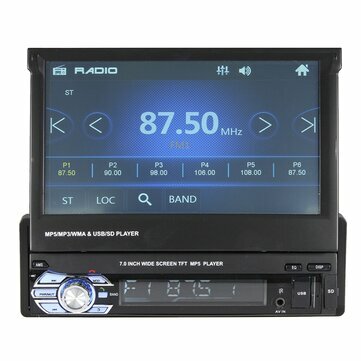 7-inch high definition touch screen, dynamic menu interface. 6. Loudness switch, loud bass reverberation aggravated extraordinary. 8. Use 24Bit DAC, precision restore fidelity sound quality. 9. Support picture browsing (JPEG format). 10. Support 24Bit 96KHz WAV format, resolution of more than music CD. 12. AUX audio input interface can add MP3, GPS, mobile phones, music players and other audio input. 13. Hardware electronic sounds (EQ) processing, multiple EQ modes, treble and bass can be adjusted. 14. USB support large current output, can charge for mobile phone (Note: Some phones may not charge, please know). 15. Support APE, FLAC, WAV, DIS lossless audio formats, support for high rate! CD sound quality enthusiast level. 16. Support TF card, high-speed USB2.0 interface is compatible with a variety of U disk, removable hard drive, hot-swappable. Audio playback support DIS, MP3, WMA, ACC, OGG, WAV, RA, AC3, MP2, AMR, etc. Video playback support AVI, MP4, FLV, PMP, RM, RMVB, MPG format. Good MP5, radio & bluetooth player.